The E-motion power assist allows the user to keep or raise his level of active mobility, and provides training effects. Through all the different possibilities of adjustment, e?motion can adapt to the individual requirements of each user. Users have a chance to stay mobile while exercising their vital functions. The load on muscles and joints is relieved. Only minimal force is required to drive the chair alone and the driver?s radius of action is increased. e-motion makes an important contribution to its owner?s independence. Thanks to the gearless drive technology and the exceptionally low noise level, you can get to where you want to discreetly and quietly. 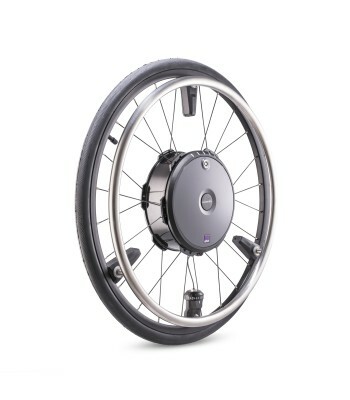 e-motion has electric motors integrated in the wheel hubs to support the wheelchair driver?s pushing force. 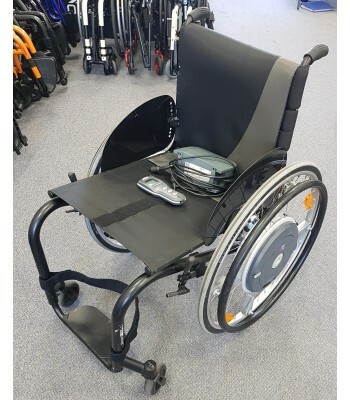 Each pulse on the push rim is detected by e-motion?s ntelligent sensors and converted to precisely the required degree of power assistance?a kind of power steering function for wheelchairs. With this extra thrust, even long distances, ramps or slopes can be overcome without having to rely on a helper. e-motion even lets you go downhill: its power assistance boosts the braking pulse, so that driving down a steep slope is not only safe but also a relaxing experience. 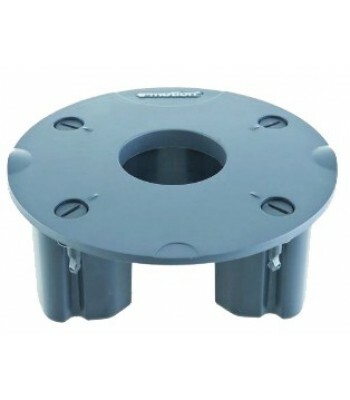 The energy for this purpose is supplied by ultra high-power lithium-ion batteries, so that a wide radius of action and unprecedented durability are guaranteed. The lithium-ion batteries integrated in the wheels are a world premiere from Alber. 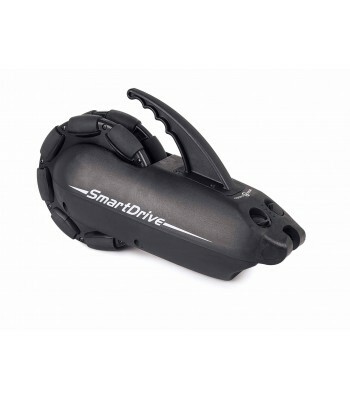 They provide a significantly extended range and last much longer than conventional battery types. Maintenance free with no memory effect ? enjoy the benefits of full battery power! 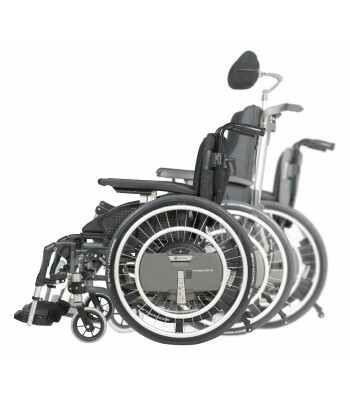 e-motion fits most of the wheelchairs normally available on the market. 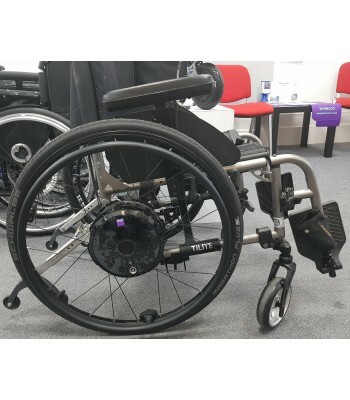 The old wheelchair wheels can simply be exchanged for e-motion drive wheels. In virtually every case, your existing, individually adjusted wheelchair can thus continue to be used. It takes just a few small brackets to fix the drive wheels to the frame of the chair. As a rule, the manually operated wheels can still be chosen as an alternative to the e-motion wheels. The desired method of motive power ? manual or electrically assisted ? is always available in other words. 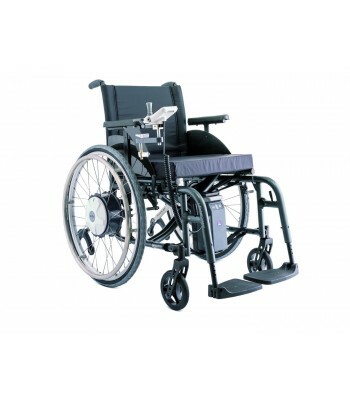 any folding wheelchair can still be folded even with e-motion attached, thus saving space. The battery charger supplied with e-motion adapts automatically to any mains voltage from 100 to 240 V ? an immense advantage for all those who like to travel. If part of the journey involves flying, the batteries can also be disconnected from the wheel and carried separately.